Deep in the burning African veld, a young boy rescues an orphaned white lion cub. But when the lion is sold to a circus, the friends are torn apart. How will their story end? This modern classic from Michael Morpurgo sweeps from a British boarding school to the African wilderness, and from the First World War to the present day. Full of striking landscapes and dramatic encounters, it is a vivid and heartwarming story of friendship against all the odds. Michael’s books include War Horse and Cool! I love it when Bertie found his lion. I loved this book the end was the best part of it.Why I liked it so much is because it was written so well. This was the first book I read by Michael morpirgo its all about a butterfly lion and a little boy, the little boy finds him . 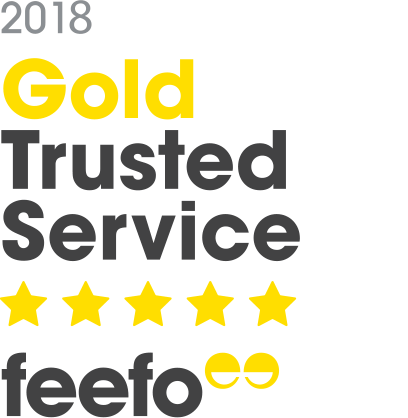 I love it if you are reading this review and you think you might like it and you want it then download it or if you have it then read it . you should love it if you are similar to me. I love this book. It is sad because it is teaching people what will really happen in life. A moving story about the friendship between a boy and a lion. 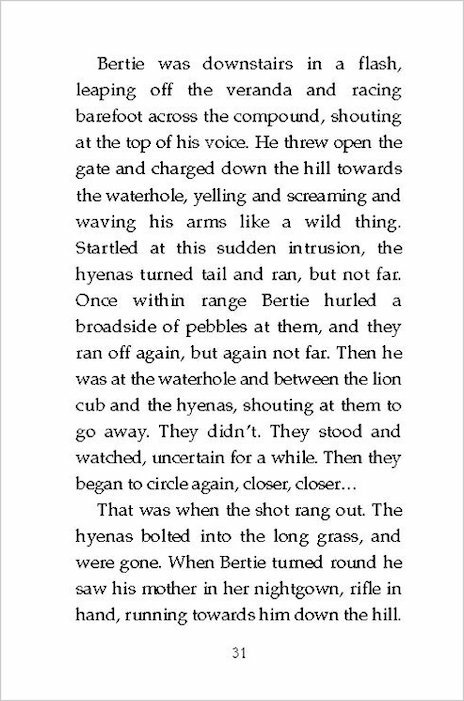 I like the part when Bertie sees his lion again. It is an emotional story. This book would be a great movie. Soooooooooooo sad, but a really good book!!!!!!! This is about a boy who befriends a lion cub. morpurgo is so creative to write a book like this. This book is hard to put down when you start reading it. It’s very sad in places and yet beautiful too. I love books that are centered around an animal. An amazing book about a true friendship and love. A very enjoyable book. A master story teller at his best!!! I think that the Butterfly Lion is an book which involves alot of adventure but is also sad at times in the book. It uses a lot of imagination and is a book which in my opinion would fit all age groups and maybe book types. This is a really good book. The story is amazing, and the relationship between the lion and the boy is extraordinary. I love this book. I want to read this as many people I know have read it and they liked it so maybe I will too. 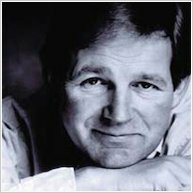 Also Michael Morpurgo is an amazing author who is just FAB! this is a really heart-warming story. This is about a boy and a lion witha strong friendship. I think The Butterfly lion is a sad but at the same time funny and exciting book. This book is great for animal lovers but if you are lighthearted this book is not for you! I would give this book 8 out of 10 stars! I just loved this book its about this boy who has to be sent to boarding school. He ran away and met an old lady and talked she told about Bertie a boy who lived in Africa who fell in love with his white lion. when the lion passed away, Bertie and his friend made a chalk drawing on the white lion and at sundown the Adonis blues would come and drink the chalk and the picture of the white lion came to life. This book touched my heart. It’s a GREAT book to read!!! this book is really lovely about a lion cub and his adventures good read! IVE READ THIS WHILE I WAS IN YEAR 4! AND IM A 11 NOW BUT THAT BOOK HAS ALWAYS BEEN A HEART TOUCHING BOOK. It was an amazing story, me and my friend read it together and loved it. this book was brilliant bertie the old woman and the white lion (the white prince) it made me love micheal morporgo books i nearly have his collection of books fo my age. This is a great book!! It is really moving and appeals to quite a range of ages! I like wild animals so I found it immensely interesting! I thought this book was good because I liked the story line and the setting! This is A LOVELY BOOK. IT IS EXCELLENT. ANYONE CAN READ THIS. This book has a fnatastic twist, as well as a strong end. The begining dissapointed me a little but aside from that this is amazing! i tried reading this book but i rely didnt like it, i got very bored and then i stopped reading it. Was really good and really enjoyed it, was very sad though, I almost cried!!! I remember reading this when I was younger and finding it so heart wrenching. I would love to read it again, and would reccomend it to anybody who wants a great read that will touch your heart. for anyone wgho loves cute cuddly lions this book is for you. as a small boys finds a lion cub lost and abandoned and it grows up to become a circus lion. very moving story. It is different. I think it has ghosts in it but I am not sure if they’re ghosts or not! Maybe spirits. The one and only white lion! GO MICHAEL MORPURGO!!!!!!! 5 OUT OF 5 STARS! It’s a good book but tell us how the characters look like. This book is really good, its emotional and makes you want to keep reading. I love this book when I start reading it I just can’t but it back down, I would deffinatly reconmend this to alot of peolpe because it is so GREAT!!!!!!! We thought this book was amusing. 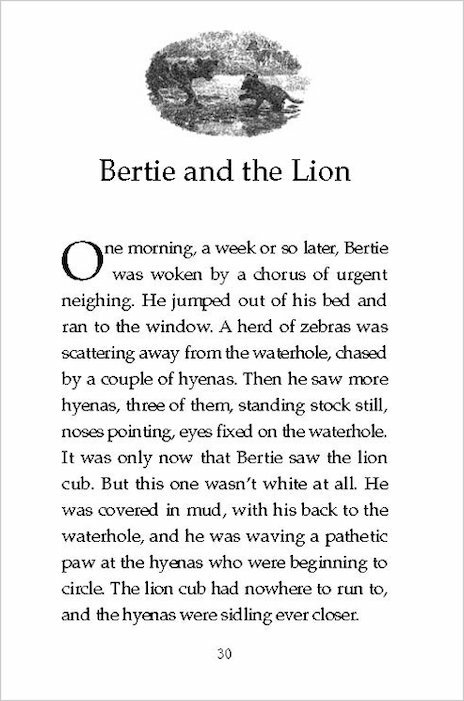 It’s about a boy Bertie who goes hunting and finds a white lion. A frenchman comes and takes the lion away from Bertie. Bertie leaves the country and later on in life he finds it again. The part which made us laugh the most was when we met the frenchman with the lion again. You could really build up a picture in your head and place yourself at the scene. We also enjoyed the part where Bertie marries the lady. We think this was romantic. Everyone loves romance, don’t you? Our favourite part though was the clever twist at the end. We think this book is an all rounder with its good times and bad. We would recommend this book to anyone, so chop chop start reading! We read this book as a class and the majority of us thought that it was not for us. Generally, we prefer to read action books and found The Butterfly Lion too slow paced. Also, the author kept jumping between different times which confused us. However, a few of us really enjoyed reading this book. 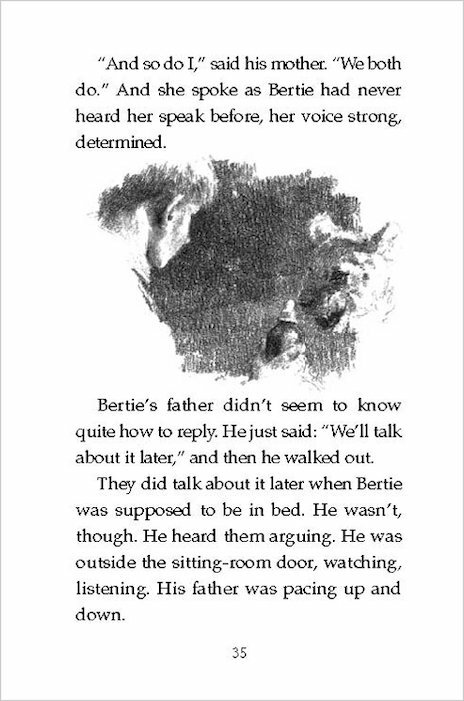 We loved reading about the developing friendship between Bertie and the lion, and found the plot unique and interesting. We would recommend this book to animal lovers and those who enjoy an emotional read. I really, really love this book. I like Michael Morpurgo’s books even though some are quite sad. Michael Morpurgo’s books are for all ages, young and old. We read this at school so did lots of work on it. It is really interesting even though the cover looks a bit groen up. My mum bought me tghis book to read again. 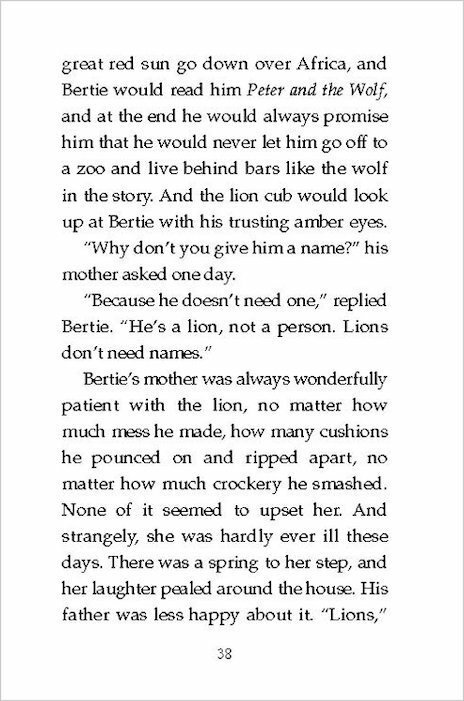 There is a baby lion called Bertie, who loses his mother along the way on a journey and in the end he finds his mother. The Butterfly Lion is a great book and I reccomend to my friedns, family and everyone. i am almost finished with the butterfly lion but it is really good and it will touch both young and old heartsabout the war and losing somthing a little boy loves best book by michael morpurgo it might bring a tear to your eyes. I really enjoyed it. I recommend this book to anyone espesially people who have a sense of emotion! 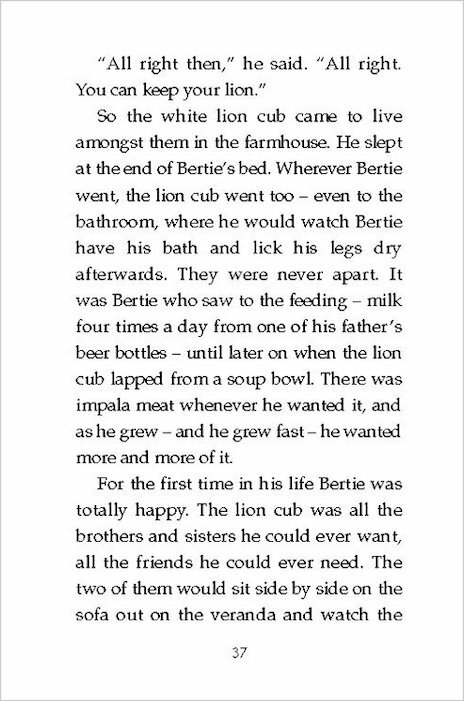 I read it and I think it is brilliant!About Bertie and the lion AWW, it says it’s a true story! It’s very heart warming, about lasting friendship and loylty. This book is lovely, it is full of detail. the first time i read it was when i was in year 3, 2 years ago and my teacher read it to us, at first i didn’t listen to it much because most books my teachers pick out are rubbish and then i got bored so started to listen and it was fantastic and at the end it made me cry and it was the first time i had ever heard a Micheal Morpurgo book! This book is great!!!! It hade loads of adjectives and e motion. As all good writers do they make you feel like your the boy (main character). The story is about a boy going to a boarding school and escapes he meats a lady and learns the story of the butterfly loin. Its a really great book, with twists all the way, I loved it, we read this book in school and everybody enjoyed reading it! I would definitely recommend this book to anybody. Even adults! It is a great book. I love it . Because i like lions. I recememend it you will enjoy it if you are reading it at the moment. I like the bit where the boy rescues the lion. I loved this, It was The First book i fully enjoyed! I liked it. If you like animals read this book! Good.I liked it alot! I would recommend it to all animal lovers. 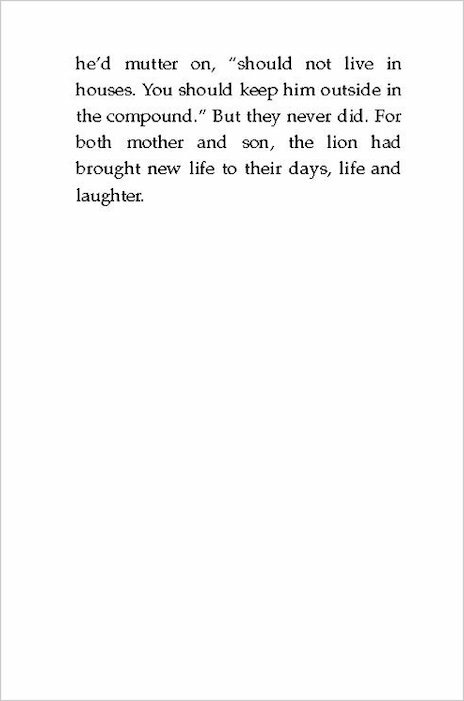 I think this book was really touching. The illustrations are very good too. I like the way Michael Morpurgo wrote it to be sad which just made the book so much book. this is a bok with a brilliant story-line.Bertie spend all of his childhood behind a fence but wants to change a white lions life forever!!!!! 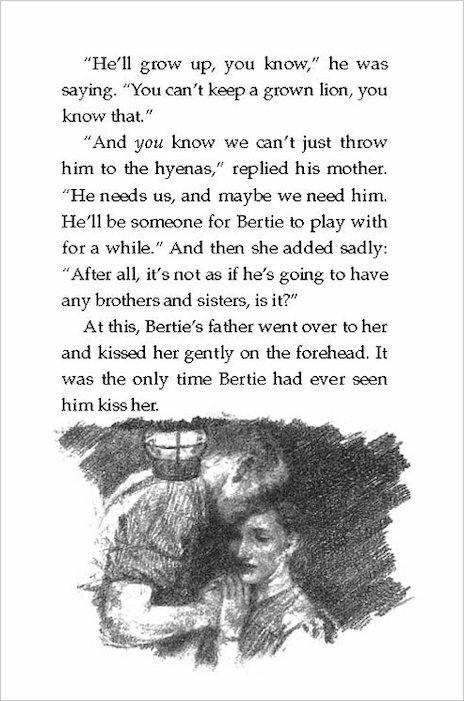 This book is a very lovely story as Bertie spent all his life behind a fence that he decided he was going to change his and the little white lion cubs life.I love the way Micheal describes him finding millie and becoming best friends, not being able for their hearts to be separated no matter what happend. I also love that their is a reason to the story as some storys are just told with no reason. this was a sad but good book.I really liked it . This book by Michael Mourpurgo is a wonerful book. A little boy hates his school and plans to run away. Whilst he is running he meets this old lady and she tells him about the Butterfly Loin. 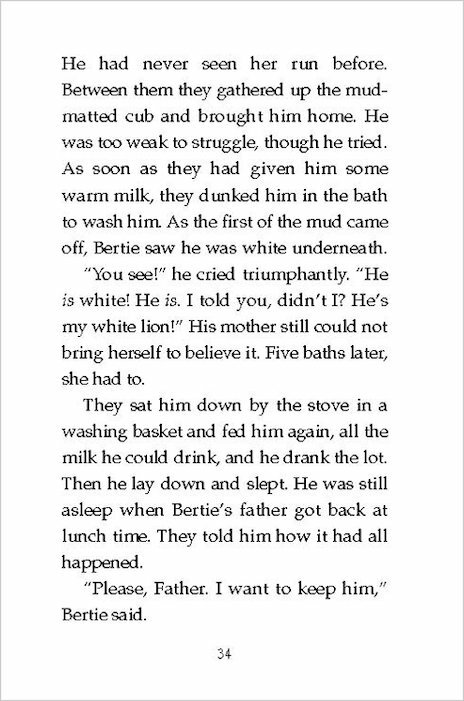 A boy called Bertie, then he finds a white lion cub with a loiness. Then one night he hears he dad saying we caught a massive lioness. Bertie’s heart was torn about. This book kinda pulls at your heartstrings. It’s a great read! I recommend it completely! I loved it and the story plot is brilliant! I love this book. It is great, one of my fave reads. it is a sad but happy story and you feel amazing emotions for the characters. Buy it, It is great. this book is one of michael morpurgo’s best books. i loved reading it !!!!! 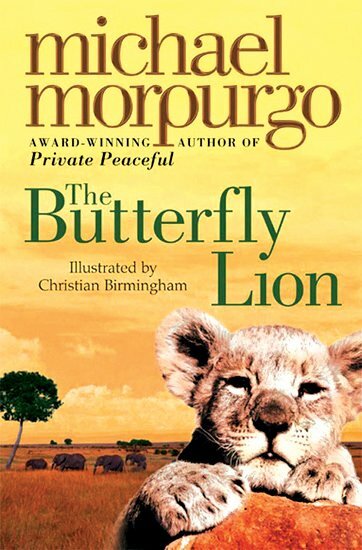 The Butterfly lion is one the best books Michael Morpurgo has written. The book is about a boy who goes to boarding school, but missed home so much that he decided to catch a train home. I’m afraid that is all I’m going to tell you, but If your interested in this book, (you should be) then buy a copy of it, or borrow it from a library. I loved it, I was originally reading it in year 6 at a new school and its just so affectionate. Its a boy who runs away from school and comes across this old woman who tells him of the young boy. It is a heart rending story about a yong boy living in Africa that befriends a white lion. It is all about how they are sepperated but always find oneother and become the bestest friends you could ever be! The book is interesting.I like it. this book is amazing i know it does start of slightly boring but keeep going with it that is what i did and the rest of story is fenominal, it moved me because it was soo well writen with enough description but not loads so you can be there while it is all happening, you can be billy if you let your mind go imagine .with all of the michael morpurgo books i have read they are all soo well writen that you can be the main charcter there you can do everything they can so weel done and thank you again mr.morpurgo another amazingly written book as per usual!!!! i would reccomend this book to any one and rate it a well deserved 10/10!!!! I loved this book. The way Michael Morpurgo weaves realistic situations into a ficton book is amazing. I would defenitely reccomend this book. But only to the ages above 9 as it has some very extended language used, though not innopropriate words. The butterfly lion is a very touching, sad yet interesting story, which i really enjoyed. this book is really good. it has lots of different emotions, happy, sad, excited, lonely. I recommend it to anyone who loves animals! I thought this was a great book but it was very sad and I cried. hey About iluvbooks why did you say you liked it and then said on the rate it was rubish? It was sad and funny and at bits happy. I am 11 coming up 12 (year 2008) and i thourght that it was a easy read. Other wise it was realy good. I love this book because it was so addicting and it was set in the safari desert and i like it when it said about the sun setting in the sky! 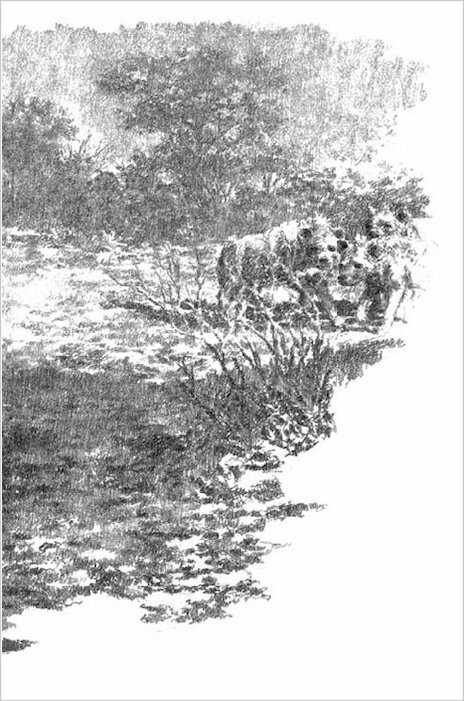 The bassic story line is that a young boy aged 3 suddenly takes note of the water hole but only when he was10 he asked to go out and help his father shoot stray animals! His dad obviously said no but a few evenings later he sees a baby lion surrounded by Heanas is going to be eaten! 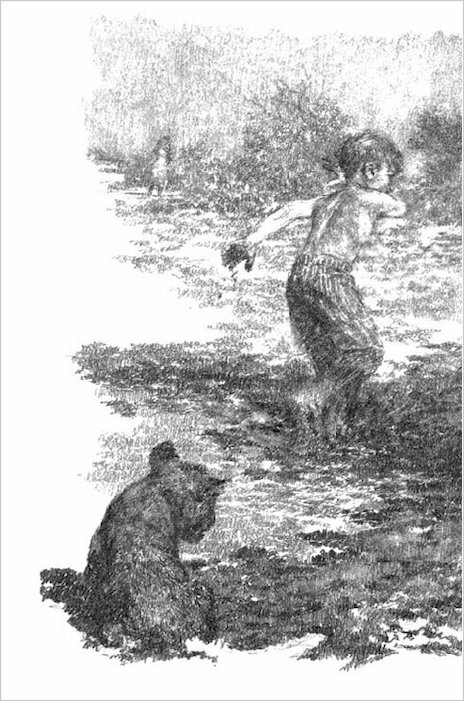 The boy climbes over the fence and rickes his life for the lion but he got back safly with the lion and his mum spotted him and rescued the boy! She let’s him bring him up in the house. One day the dad says he must go but the mum peswdes him to let the lion stay for a few more monthes. This book was brilliant book to read I think it is a bit sad and happy book so if you like sad and happy books read it you’ll like it. I think this is a brilliant book because it has a lot of twists and it is sad but amazing at the same time! It just makes you want to read on!